A file photo of Chinese journalist Gao Yu speaking at a press conference in Hong Kong. 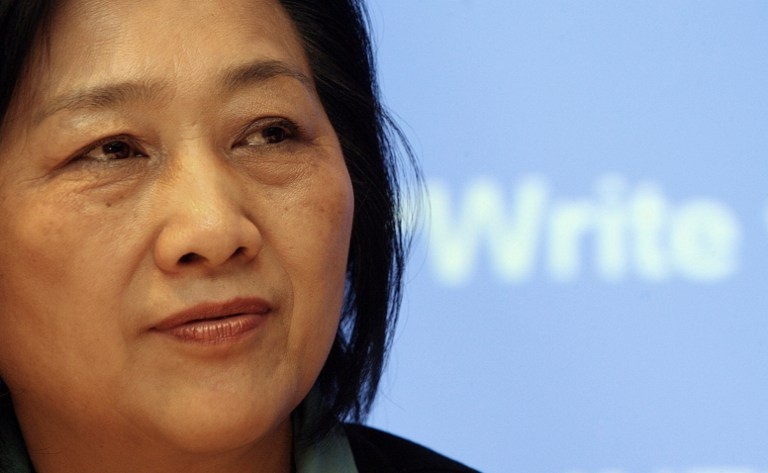 Now, we have finally got to the bottom of the matter: internationally respected journalist Gao Yu, who is over 70, is in the hands of a government department. According to Xinhua news agency citing the authorities, Gao Yu has been criminally detained for "leaking state secrets." These so-called state secrets that were allegedly leaked last year consisted of "Document No. 9." This is surprising. How can a document issued by a political party be designated a state secret? Who is entitled to make such a bizarre decision? That's the first strange thing. The second strange thing is that Gao Yu isn't a party member, so the requirement to keep the party's secrets isn't binding on her. She hasn't even violated party discipline, let alone leaked state secrets. The third strange thing is that the Chinese Communist Party isn't a secret party; it's not an underground party. It issued its "Decision to open up the party" way back in 1949. So what activities is it still engaging that it can't tell anyone about? The fourth strange thing is that ideology has become a state secret. People often talk about military secrets and economic secrets, but we hear that Document No. 9 is an ideological document. For ideology to be designated a state secret isn't just strange; it's utterly ridiculous. Of course, there is a possibility that the document was issued in error and contains incorrect information, and that its release will do incalculable damage to county and people. If that's not the case, then what crime has Gao Yu committed in transmitting information about the Chinese Communist Party? If this document does contain serious errors that will damage the party's image, then reason dictates that the responsibility should lie with those who drafted it and released it. But instead, the relevant authorities are shifting suspicion and blame onto a journalist's shoulders. If it's illegal to gather and disseminate information, then what room is there for journalists to exist at all? That's the fifth strange thing. I call on all Chinese, especially those who work in the areas of law and public opinion to pay close attention to how this case develops, and to prevent it from setting us on the slippery slope to evil. If we don't return to the healthy path of developing a constitutional government and the rule of law, the result will be untold misery to party, country and people. This arrest shows that China's party-state feels free to arrest any of its imperial subjects (who are not treated like citizens) for any reason, however ridiculous, and hold them in communicado. Apparently this is a key part of the "great, glorious, and correct" Chinese Model that everybody on Earth should be imitating daily.